Kaido Books and Coffee is just down the street from my third (and final) hotel of my trip. I’ve done extremely well when it comes to good coffee near hotels/work on this trip and Kaido (plus a branch of Blue Bottle at Shinagawa Station) is the icing on the cake. It was also an unexpected surprise, a random discovery as I explored the rather lovely residential street I found myself staying on. Kaido Books and Coffee does what it says on the tin: a book shop combined with a coffee shop. In fairness, though, it’s more like a coffee shop with plenty of books. In fact, I didn’t see anyone buy a book the whole time I was there! It seems that the books are more for the customers to browse as they linger over their coffee. Kaido serves coffee from And Coffee Roasters and Ishikawa Coffee, although while I was there, all of the coffee on offer was from And Coffee. There was a choice of three single-origins (two Ethiopians and a Brazilian) on pour-over through the V60, one of which was also available on espresso. Kaido does a limited range of food, which includes a small cake selection. July 2018: I’ve updated my piece on Kaido Books & Espresso. This is the original write-up, published in April 2017. For an up-to-date description, please see the updated post, while you can see what’s changed in my Coffee Spot Update. You can read more of my thoughts after the gallery. Except there is no gallery and won’t be until Dell fixes my laptop (at this rate, looking unlikely until I get back to the UK). So much for global next business day replace/repair. For the actual gallery, see the updated post. An advantage of staying slightly off the beaten track (in this case just south of Shinagawa Station) is the opportunity to explore areas you’d never otherwise visit. Initially I didn’t have high hopes: areas around major stations are rarely anything to write home about and so it is with Shinagawa, which is very bustling, modern and high-rise. However, where I’m staying in Kitashinagawa, it’s a different story. Kitashinagawa’s a lovely, quiet residential area. You’d never think you’re in the centre of a major city, 10 minutes’ walk from a massive train station (think Waterloo/Victoria, crossed with the long-distance trains of King’s Cross or St Pancras). The narrow, central street is packed with local shops, restaurants and housing. In this case, Kaido Books and Coffee, very much a local establishment, fits in perfectly. Occupying the first two floors of a narrow concrete structure, Kaido goes back a long way and is perhaps three times as deep as it is wide. The front, slightly set back from the street, is all glass with a sliding central door. Inside it’s mostly concrete, although the right-hand wall is painted with an interesting mural. The overall effect’s much more warm and welcoming than it sounds though, especially since it’s lined with books. Wooden furniture and comfy chairs add to the interior’s warmth. On entering, you’re greeted by a pair of very comfortable armchairs. These flank the door, facing onto the street, each with its own coffee table. Beyond that, behind a large box of books, is another armchair, again with a small coffee table, but the bulk of the seating’s on the right, a padded bench running the length of the wall, two thin, four-person and one thin two-person tables in front of it. The left-hand wall, meanwhile, has a set of minimalist bookshelves with coffee-table books and magazines. It can be a bit tight getting through when it’s busy, but it’s a lovely, cosy spot. At the back, it narrows ever so slightly, two wooden steps leading up to a brick-floored area, where you’ll find the coffee part of Kaido. Dominated by the counter on the left, this brick-built beauty has the till at the front, followed by a hulking Nuova Simonelli espresso machine, then a small pour-over station for the V60s. Right at the back, a set of stepped, square bookcases cleverly masks a concrete flight of stairs leading to the gorgeous upstairs. The atmosphere here is very different, quieter and more studious. A single space has been transformed by bookshelves which line every wall, also subdividing it into a series of smaller spaces. At the back, there’s a central communal table, while off to the right (left as you look from the back) is a delightful two-person nook with a bar against the wall. At the front is a larger space with two communal tables and, by the window, a gorgeous sofa, facing into the room. There’s also a small balcony accessible via the sliding window/door. However, you can’t sit out here, only stand and admire the view. Although upstairs is still the same concrete shell as downstairs, it has lovely, wooden floorboards, the concrete walls masked by the floor-to-ceiling bookshelves. There are multiple power outlets too. Both floors have lots of natural light from the windows at the front, which is supplemented by multiple spotlights, particularly at back. 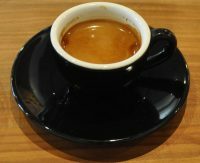 I started with a single-origin espresso, a Yirgacheffe Wolleka, which was served in a classic black cup, accompanied by a glass of water. It was excellent, with a fruity bouquet. A little sharp on the first sip, it mellowed as it cooled, with very much a front-of-the-mouth taste. I followed this with the same coffee as a pour-over, which arrived in a larger, classic black cup. This was a lovely, delicate, sweet coffee which really grew on me as it cooled, holding its own even when cold. Definitely one of the best pour-overs of the trip so far. I also had one of the little cakes (a Shinagawa Shiro Renga), which arrived with a napkin to clean my hands before eating (typical Japanese service). Akin to shortbread, it was quite sweet, but a little softer and with a slightly coarser texture. December 2017: Kaido Books & Coffee was a runner-up for the 2017 Best Overseas Coffee Spot Award. In other news, I bought a bag of the Yirgacheffe Wolleka beans to bring home with me. If you believe the rumours, it will be making an appearance next weekend at a special Japanese cupping at the Glasgow Coffee Festival.